For starters, the picture shows a girl. Her name is Ed.note The main character of the show is a man with dark green hair named Spike; you'd never confuse Ed for him. "Cowboy" is in-universe slang for "bounty hunter" and is not a character's name, and Ed probably wouldn't qualify for the title. "Bebop" is the name of their ship. 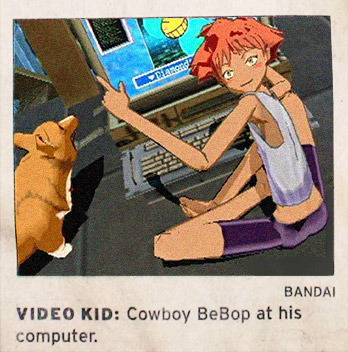 The series never uses the capitalization "BeBop". The computer does not belong to Ed, and the only part of the computer shown here is the monitor. As such, the only correct words in the caption are "at" and "Bandai". "Everything you read in the newspapers is absolutely true except for that rare story of which you happen to have firsthand knowledge." This is when the media reports blatantly incorrect facts about a creative work that any fan or casual observer would know to be wrong. It seems like some people just can't be bothered to do any fact-checking. Let's face it — sometimes, it's easy to do. But what about the news? Newspapers, a News Broadcast, national news, etc.? It is in their job description to do at least some research, to make sure they aren't stating factual untruths. This rule apparently doesn't apply much to works of fiction. Maybe the news media doesn't seem to care as much about it in question as about whatever effect it had. But that's no reason to make an error that could have been avoided by looking into the material a bit, especially if said error involves serious accusations like blaming a child's death on imitating something they saw on TV. This often results in examples either factually incorrect, from minor to grossly wrong like the trope namer, or taking some "facts" from The Theme Park Version of a larger entity, which to some is much worse than just not doing the research. Compare Complaining About Shows You Don't Watch. See Fandom Berserk Button when it's the fans who get the names wrong. I Am Not Shazam is a key trope involved. Also compare Dan Browned, the version for fictional works. See New Media Are Evil, though if you find yourself constantly annoyed by this kind of thing then you probably believe Old Media Are Evil. See also Animation Age Ghetto for when people dismiss various kinds of cartoons as childish when they, in fact, are not. For a problem endemic to Anime and Manga, see All Anime Is Naughty Tentacles. This can also overlap with a Shallow Parody if the parodists in question are really careless with their research. This is basically the Real Life version of Critical Research Failure. "TV Tropes is a TV channel who depicts various clichéd elements where even sitting on a chair is applicable to a work. You can waste a whole day watching it!"